A look inside one man's "waking dream." He lives in a small cabin up Emigration Canyon. It’s quiet, secluded—a notable UFO hotspot, he insists. He spends his nights scanning the black, star-filled skies above the canyon, hoping to catch a glimpse, and maybe even a snapshot, of something otherworldly. Rosenfeld runs a truck-washing business and devotes much of his free time to investigating paranormal claims—mostly extraterrestrial encounters. He drives a camouflaged Blazer and carries with him a modest investigative field kit comprised of a 35mm camera, a camcorder, a tape recorder, binoculars, flashlights and magnets. Magnets? You never know what might come in handy when seeking to expose E.T. Rosenfeld’s equipment does seem, well, a bit inadequate. Rosenfeld’s search is not for his own benefit, he says, but for ours. He already knows the truth. Rosenfeld says he has experienced lost time, had alien implants placed inside his body, communicated with alien beings face-to-face. “I don’t really care what people think about me because I know what I’ve seen,” he says plainly. I nod and smile as his two-year-old son, Jackson, scurries in and out of the room with a set of Matchbox trucks. I can’t help but wonder if this child too will one day grow up to see his own little green men. Rosenfeld was born in San Francisco in 1968. He was adopted by a couple from Salt Lake City and raised here as the youngest of five children. His father sang in the Mormon Tabernacle Choir and worked as a driver’s license examiner before becoming a security guard. His mother was a nurse at a rest home. Rosenfeld was a quiet child. He describes himself as an artistic loner who loved the outdoors and science fiction movies, especially “Star Wars.” His youth was also marked by inexplicable dreams. The dreams, he says now, were more than they seemed at the time. In the summer of 1977, young David was camping in the Uinta Mountains with his two older sisters when he says he saw a large, noiseless object that looked like a red/brown potato moving slowly across the night sky. The craft tumbled end-over-end until it disappeared over the horizon. Then another craft appeared, he says, a simple white light performing complex aerial maneuvers. Rosenfeld says his first face-to-face encounter with extraterrestrials happened when he was 25. He was bow hunting near Current Creek in Uintah County. The sun was setting as he started back for his campsite, when he got the unsettling feeling that something was there. He felt a headache coming on so he sat down on a log next to the road to rest. A few moments later, a bright ball of light appeared. It spoke to him. Rosenfeld’s description of the being is—perhaps not surprisingly—vague. He says it took him by the hand and transported him to a windowless, white room reminiscent of those in which Hollywood often stages such encounters. Rosenfeld says he realized then that the dreams of his childhood were actually alien abductions, and the aliens had finally deemed him ready to experience an encounter while fully conscious. And yet, as with all his encounters, he’s not certain how he got to the room. He can’t be sure he was taken aboard a spacecraft. In the room, Rosenfeld says he saw other humans and aliens, including a female alien that seemed intent on calming his fears. The “grays”—small, large-eyed humanoid creatures—were the most prominent aliens in the room, but there were others too, like a creature Rosenfeld describes as “bug-like” and twice the size of a human. They spoke to him telepathically, he says, and were basically friendly. Sometimes the aliens perform experiments on him and the other abductees, Rosenfeld says. When he was 27, Rosenfeld discovered an alien implant of some sort in his right ear. “I just knew it was something that shouldn’t be there,” he says as he leans against the kitchen counter, puffing on a cigarette and clutching his earlobe. The aliens eventually removed the object, he says. Since that first conscious abduction nine years ago, Rosenfeld claims he’s been taken many times. But for the time being at least the alien away team appears to be on shore leave, because as Rosenfeld says, it’s been over two years since he was last abducted. Rosenfeld tells me he is mired in a court battle over custody of his son. Not surprisingly, Jackson’s mother argues that Rosenfeld is delusional, but of course, Rosenfeld insists his belief in UFOs doesn’t impair his parenting abilities. 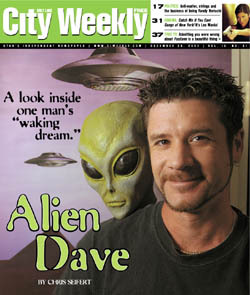 Whatever is going on inside Alien Dave, it’s clear he sees little green men everywhere. Agent Mulder always seemed vindicated in his fanaticism. A creture was lurking under the bed. A puddle of alien goo had possessed another victim. A spaceship was buried in Antarctica. They were great stories, but fantasy is fantasy, and everyone knows the difference, right? Maybe not, says Joe Nickell, a senior research fellow for the Committee for the Scientific Investigation of Paranormal Claims. Nickell is a former magician and private investigator who seeks logical explanations for the paranormal and inexplicable. Alien abductees “may be telling the truth as far as they know it, and they may be perfectly sane,” Nickell says. Many alien abduction accounts are the result of something called “waking dreams.” In such a dream state, a person’s mind is partially conscious while his or her body remains paralyzed in sleep. This disconnection between mind and body renders individuals susceptible to apparitional-type experiences that seem real to the person. Usually, these experiences are manifestations of a person’s hopes or dreams, Nickell says, and many spiritual or religious experiences can be explained by this phenomenon. Individuals of normal mental health are known to have such experiences, and waking dreams are more common than sleepwalking, Nickell says. But some people probably do see what they deem to be UFOs or aliens while fully awake. Within a normal range of people, Nickell says, four percent are classified as “fantasy-prone personalities.” Such individuals may have difficulty distinguishing between their conscious and subconscious minds while in a daydream-like state. Alien abductees, Nickell points out, never seem to be the skeptics. Doctors, lawyers, engineers, etc., are rarely “taken.” Instead, abductees are generally “emotional thinkers—creative, intuitive, fantasizing.” “I hasten to add,” Nickell says, “as a poet, I have some of those traits. Many of us have many of those traits, but the fantasy-prone person has them in spades. UFOlogy—the study of the UFO phenomenon—is a new kind of religion to believers, among whom Rosenfeld is a sort of spiritual leader. Rosenfeld is co-founder and president of a local group known as the Utah UFO Hunters, 23 Utahns who share Rosenfeld’s conviction that the truth really is out there. The group started in 1996 during a visit to the Uinta Mountains. A friend’s daughter pointed to a shooting star that turned out, Rosenfeld claims, not to be a shooting star at all, but rather a bluish-white light that sailed gradually across the sky. He says they saw about 20 that night. As part of his role as president of the UFO Hunters, Rosenfeld manages the group’s website, an online labyrinth of paranormal information, including eyewitness accounts, photographs and art. Mark Woody, 40, a respiratory therapist from Centerfield, Sanpete County, stumbled across the UFO Hunters’ website four years ago. Woody expresses admiration for Rosenfeld, but their styles are different. Woody, too, considers himself a serious investigator of the unknown, but he knows what he’s seen and understands there are limits to what he can say he definitively knows. Woody hasn’t been abducted. He hasn’t seen any little green men. The UFO Hunters gather for sky-watches regularly. They head to the location of the most recently reported local sighting and wait. Most sky-watches last until the next morning because UFO activity usually happens just before dawn, Woody says. UFO Hunter Troy Jackson, 38, a probation officer in Salt Lake, has heard Rosenfeld’s stories and knows just how crazy they sound. The UFO Hunters meet monthly at the Hunter Library in West Valley City, a kind of paranormal-enthusiasts support group. Woody and Jackson make it when they can. Rosenfeld is almost always there. A guest speaker—usually a paranormal author or expert—is invited to chat with the group, and members share their experiences with fellow believers. Everything’s fair game: extraterrestrials, out-of-body experiences, reincarnation, lost time, alternate dimensions, talking fields. Members share tales of personal encounters with mysterious orbs of light or ghost-like praying mantises. They talk of being sucked inside crop circle energy vortexes. No one laughs or snickers. For the UFO Hunters, this is a safe arena. Such uncensored expressions of belief seem to have their own dangers, with tall tales leading to even taller ones. So this is a close-knit group. They have likely circled the wagons out of necessity. There is a conspiracy. Our government has recovered a crashed alien spacecraft, and they don’t want us to know about it. It began half a century ago, Rosenfeld says, at the infamously alleged alien-crash site near Roswell, N.M.
Maybe it seems implausible that thousands of U.S. government employees would keep so quiet for so long. But Rosenfeld is certain of this. For him, plausibility is barely part of the equation. We’ve been programmed since birth by television, by the mainstream media, by religion to believe exactly what they want us to believe, he says. Conspirators are everywhere: in Congress, NASA, the FBI. There’s a government within a government controlling this operation. We didn’t go from computers the size of rooms to microchips overnight without some kind of help. It’s all part of a strategic ploy by the government to desensitize the populace to the inevitable: alien contact. The conspiracy can’t possibly last forever. The truth’s coming soon. A polite, stony-faced nod seems the only proper response. Nickell, the debunker, recognizes the pervasiveness of extraterrestrials in popular culture, but he has a less sinister explanation. The aliens are part of an evolving modern American mythology, he says. A hundred years ago, people reported being abducted by fairies. The fairy claims faded in the 1940s, as science fiction stories popularized tales of visits by otherworldly saucers. By the 1950s, people reported meeting beautiful Venetian women who traveled inside the saucers. With the Betty and Barney Hill alien abduction story of 1961, the large-eyed grays the couple described became the aliens of choice and have remained so ever since. UFO reports have actually declined over the past decade, says Kevin Christopher, public relations officer for Skeptical Inquirer Magazine. Individuals invent alien spaceships and extraterrestrials in an effort to place meaning on things they can’t explain otherwise. To illustrate just how easy it is to be duped, Christopher, armed with a two-by-four and some rope, helped create two crop circles last year—one in a wheat field in upstate New York, and another in a wild-grass field in Buffalo, N.Y.
Rosenfeld’s own encounters fit the pre-existing mythology to a T. Proof is what he needs, but the proof eludes him. Since the formation of the UFO Hunters in 1996, Rosenfeld says he has photographed more than a dozen UFOs. In January of 1998, he took a 10-minute video of an unidentified object floating high over Salt Lake City. The video is shaky, but the camera follows a diamond-shaped, semi-transparent object meandering across the sky. At one point, a light flickers on at the top of the object. Later, a smaller object appears to eject from the bottom and zips around in a circular motion. Halfway through the video, Rosenfeld zooms away from the object and then zooms back in on a nearby jetliner to demonstrate the difference in appearance. The object’s not an airplane, but labeling it a Romulan Warbird strikes me as premature. If Rosenfeld’s video isn’t absolute proof of extraterrestrials—and it’s not—then the UFO Hunters say it’s at least a significant clue. The videotape, along with two of Rosenfeld’s photographs, have been analyzed for authenticity by the National Institute for Discovery and Science, a privately funded organization based in Las Vegas that hires ex-military and law enforcement officers to investigate the UFO phenomenon. NIDS’ findings were inconclusive, but the photos and video had not been doctored, they said. But Rosenfeld’s evidence hasn’t convinced many professional skeptics. Maybe the little green men are Rosenfeld’s own brand of imaginary playmates. Maybe, as Nickell suggests, they’re simply waking dreams, expressions of Rosenfeld’s deepest hopes and fears. Even so, there is something child-like and strangely compelling about Rosenfeld and his devotion. Deputy Peggy Faulkner of the Salt Lake Sheriff’s Office has no recollection of bright lights or UFOs being reported over Emigration Canyon, but the idea that someone would suggest such a thing doesn’t faze her. If the stories are true, then surely other residents of Emigration Canyon have seen something. Anything. “No,” says Tonna Russell, 25, a server at Ruth’s Diner. “No, I haven’t.” The diner is two miles from Rosenfeld’s cabin. Those are the moments Rosenfeld lives for. Yes, people laugh. Rosenfeld knows it and doesn’t care. So Rosenfeld continues in his dogged pursuit of the truth. Of undeniable proof. And maybe, like the idealistic quest of his television counterpart, his personal journey will bring him ever closer to the proof he seeks without actually reaching it. He smiles. The night is dark, the air is cool and snow flurries tumble to the ground. “Keep your eyes up,” Rosenfeld instructs. His words seem part admonition, part punch line. Funny. Talking to Rosenfeld almost makes you want to believe. Salt Lake City Weekly and slweekly.com ©1996-2003 Copperfield Publishing, Inc.. All rights reserved. the sceptics and debunkers, who apparently haven't spent more than a few hours looking into the subject. Believe in swamp gas and GOD but don't have hard proof that either exist. Meanwhile.. millions of people are witnessing, photographing, and video taping UFO's. yet millions believe in him so greatly they discredit any other theory. The X-Files is absent from the airwaves this television season, but Salt Lake City has its own real-life Fox Mulder on the case: “Alien” Dave Rosenfeld. Rosenfeld, 34, is an agreeable fellow, simple and plainspoken. At our first meeting, he’s wearing blue jeans, a gray baseball cap and a black T-shirt with green lettering that identifies him as a member of something called the UFO Search Team. His thin, dark beard outlines an easy grin. We shake hands, and I can’t help being impressed by his warm demeanor. He’s instantaneously your buddy—a regular Joe from across the street. But there’s something different about Rosenfeld. He believes we’re not alone. And he’s driven, like “Spooky” Mulder, by a personal quest to locate undeniable proof that extraterrestrials are, indeed, visiting our planet. “That’s why they call me ‘Alien Dave,’” Rosenfeld beams. maybe Joe Nickell would like to view one of 'my' photographs of what he calls a 'waking dream'. that I somehow manifested onto 35mm film & analyzed by The National Institute of Discovery Science. Otherwise this statement is typical of what main stream media journalism puts out about UFO witnesses. there are 2.9 million of us! having these 'waking dreams' you don't take that serious?